Congratulations! Choosing new hearing aids, whether for the very first time or for your umpteenth update is a very exciting time. Scrolling through the sleek new styles and reading about the powerful new features can make your heart feel aflutter. Although fun, choosing new hearing aids can also feel a bit overwhelming at times. Taking these things into consideration when selecting your hearing aids will help make the process smoother. Know your priorities. We put this one at the top of the list because we believe it is the most important. If you’ve done research on hearing aids, you know there is an extremely wide array of options, features, manufacturers, designs and styles to choose from. In order to sift through and find the best aids for you, it is important to know what your priorities are. Are you a busy professional who spends hours a day on conference calls? Then hearing aids with advanced streaming features may top your list of priorities. Are you one amongst us that is terrified of all things technology? Then hearing aids with more manual features may be a priority for you. Do you love kayaking? Then hearing aids that are highly water-resistant may be where you start. Take the time to answer these questions and you’ll already have narrowed your search significantly. Have a financial plan. Hearing aids have the power to dramatically improve your quality of life in all areas, however, they are not currently covered by Medicaid or many health insurance plans. It is extremely important to come prepared with a financial plan for paying for your aids. Most hearing healthcare professionals will offer financing options to help alleviate some of the upfront costs, but even with financing hearing aids are still a financial investment for both. Having a plan for how you will pay for your aids as well as setting a monthly budget will help to alleviate the sticker shock, and will also help us to better narrow down the price point of the aids you are seeking. Enlist a loved one. When choosing new hearing aids and during the first few fittings, there is a lot of information to be processed. While we will take the time to fully help you understand everything there is to know about your new aids, it is still nice to have an extra set of ears in the conversation! Between you and your loved once, the chance of pertinent information being forgotten is diminished. Plus, its always more fun to choose something new with a friend in tow. Consider your current technology. Like most devices today, modern hearing aids are power-packed with incredible technology. 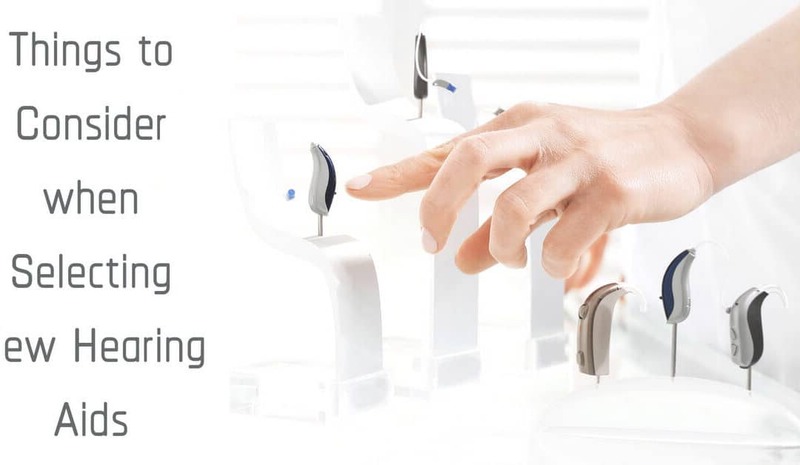 When choosing hearing aids, it is important to first consider the technology you currently own, and how comfortable you are with learning new gadgets. For example, some hearing aids can stream phone calls directly from smartphones. If you do not own a smartphone, then investing in this type of technology probably isn’t worth the money for you. If, on the other hand, you are tech-savvy and your house is chock full of “smart” devices, then hearing aids that can link up with these “smart” features could make your life much easier. Understand there is an adjustment period. Your new hearing aids will alter one of your most important senses, and will change the way to interact with your world. This change will definitely come with an adjustment period and some growing pains. Understanding that some things may sound odd or too loud before using hearing aids, will help you to avoid fear and disappointment later on down the road. If your new hearing aids are truly bothering you, reach out to your healthcare professional. Often, multiple fittings are necessary in order to perfectly fine-tune your hearing aids to match your hearing profile, lifestyle and personal preferences. If you feel like you are in the dark when it comes to choosing your new hearing aids, you are not alone. We understand that with all the options available choosing hearing aids on your own can be very difficult. This is why we are here to help. We can walk you through the process of choosing aids and help guide you towards hearing devices that perfectly meet your needs. Reach out to our friendly team today.